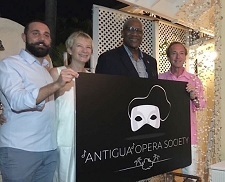 The Antigua Opera Society was launched in February 2018 in the presence of friends, supporters, Opera Director Gianmaria Aliverta, from Milan, and His Excellency the Governor General of Antigua and Barbuda, Sir Rodney Williams. It is a non-profit organization and any surplus revenue goes to further the objectives of the Society. The Society’s professional staff is not paid; all time and efforts are voluntary. Through the vision of Aneta & Marcel Polk, and the partnership with Judith and Rodney Dodd as co-founders, the society exists today. Key to the success of that vision is a judicious mix of professionals and keen enthusiasts. The AOS endeavours to offer a different form of entertainment on the island. Its goal is to extend the sense of well-being by using the medium of opera to stimulate emotion through music and storytelling. For seasoned opera lovers, there are new interpretations of familiar classics or variations in traditional productions. The most notable difference, for audience and singers alike, is the facility to perform outdoors under the beautiful Caribbean night sky. Opera singers are classically trained professionals who have not only mastered the art of vocal acrobatics but are also accomplished actors with the ability to transport their audience to a different place and time. Through immersion and appreciation of the technical virtuosity displayed by opera singers, the AOS hopes to inspire another generation of talent in Antigua, not just in music, but all forms of theatre and production. The AOS shall continue to showcase the best opera stars in a variety of locations across the island with the intention of reaching a broad spectrum of people and hope to inspire and provide a platform for the next generation of talent. The creation of a professional level Opera performance, wherever in the world, requires a huge variety of skill sets: opera directing, soloists, musical accompaniment, sound, lighting, costume, make-up, printing, marketing, board and transportation and much more. All of the above requires two starting blocks: Enthusiasm and Finance. We hope the AOS demonstrated its unbridled enthusiasm by bringing yet another season of Opera performance to Antigua in 2019. Finance is always a challenge, in all non-for-profit endeavours, so we remain eternally grateful to our sponsors, donors and partners and encourage you to join the AOS and help us grow by becoming a member and receive the Society’s Newsletter with advance information, priority booking, discounts and/or special events, a mention in the Society’s Program and advertising possibilities. To our wonderful audience, to our enthusiastic members and to our generous sponsors, thank you for helping us to realize this very special project! For more information, click here for News and Specials.